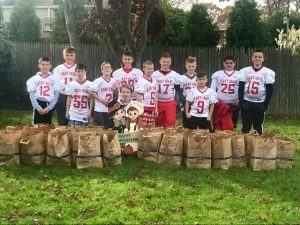 Coach Henry Nunez’s East Islip Redmen football team, all 10-year-old students at the district’s John F. Kennedy and Ruth C. Kinney elementary schools, recently took up a food collection for the Adopt-A-Family Program through Long Island Cares food pantry to help those in need during the holiday season. 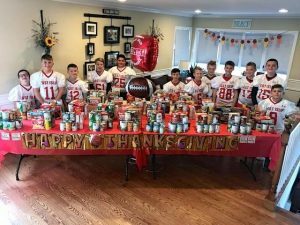 The team collected enough food to feed 40 families this year, packing it and delivering it personally to Long Island Cares. 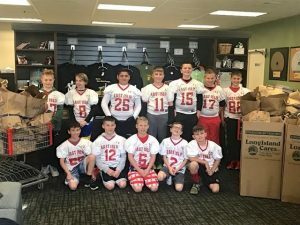 Photo Caption: The East Islip Redmen football team, all 10-year-old students at John F. Kennedy and Ruth C. Kinney elementary schools, collected enough food to feed 40 families via the Adopt-A-Family Program through Long Island Cares food pantry.